This entry was posted in Recent Posts and tagged Audrey Dawn, Childhood, Click it Clack, Family, Haiku, History, Locomotives, My sister and I taking photos, Natiinal Train Day, Nebraska, Past, Photography, Poetry, Railroads, Smiles, Trains. Bookmark the permalink. You should definitely try to rob the train. You know, I was with (baby) my sister, Leah, when I took this photo. I made her sit in this spot for a long time, as the trains come by her town every fifteen minutes. I wanted a train picture. This was taken last summer. *laughing* I bet she complained! No, she was happy to sit with me. You would have complained, however, I’d have let you play your strat for me while we waited. It’s one of the coolest makes of classical guitars out there! Yes, I looked it up. Do you have one? I know! I should get one with a cutout…and pickups, I’m thinking. 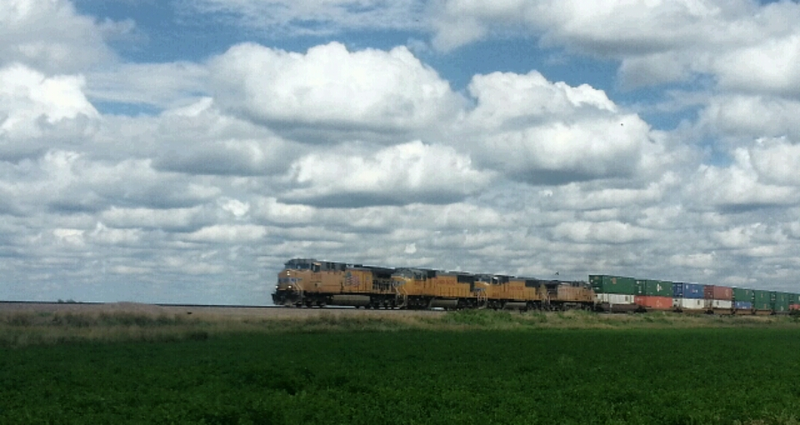 Trains are so awesome to view out on the Plains. They are very long indeed. Mostly coal from Wyoming heading east. When my son was little, he LOVED trains! We rode on many a train, including Amtrak, and visited all kinds of train museums and such. Lovely memories this one stirred. Happy Mother’s Day, my friend! One of my very favorite childhood memories is of taking a train ride to the end of the line and sitting on the station platform to eat our brown bag lunches. I probably ate p&j and sat with my legs swinging over a wooden deck. We had just graduated from kindergarten in Enterprise, Alabama. It was the only day of kindergarten I liked. That train, trundling along on its tracks – outside the windows I saw the whole world rolling by, all its secrets intact. You wrote a poem just for me. Thank you, Audrey. Shari, I can’t begin to express my enjoyment over your words. No matter how terrible Kindergarten was, the fact that you recall one day as perfect is good enough. Your vivid picture of your moment makes me feel like I was with you. I’m always so thrilled when my words work for you, my kindred. ♡ You are very welcome. You absolutely got it right – thanks!